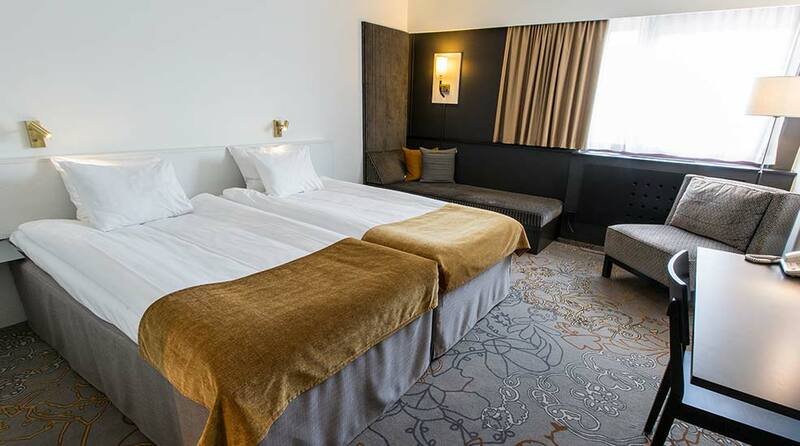 The Quality Hotel Royal Corner in central Växjö is ideal for a conference with colleagues or a weekend away with friends and family. Guests can enjoy a dip in the pool, free parking and excellent conference facilities. This is a cash-free hotel. We want to make sure that your breaks leave you feeling sufficiently relaxed and energised - a Quality Break in other words. And you can look forward to delicious lunches and dinners. We have understood the importance of breaks during a long day of meetings - so much so that we want to make your breaks as good as possible. Our Quality Breaks include complimentary coffee, tea and fruit all day, for all our conference guests. It's the perfect way to boost your mood when you need it the most. The delicious food provided during your conference will be served at La Castellina, a restaurant that offers both fixed conference menus and tailored menus. Three-course dinners or buffets, simple or formal, we will make sure to cater to your needs, literally! Please contact us for further information. For more information or a quote, please don't hesitate to contact us on +46 470 70 10 06 or at meeting.royalcorner@choice.se.